On the 4th of April 2016, Future Cape Town, and the Urban Design Institute of South Africa (UDISA) presented the event series ‘The future of public space’, at 71 Hout Street. This event was the first installment of a three-part lecture series on public space. The event comprised of three presentations, two Pecha Kucha (20 seconds x 20 slides) presentations and a panel discussion. The series seeks to promote discourse on public space seeks to promote discourse on the contemporary challenges of the public realm against the backdrop of deepening inequality, fast urbanising cities and increasing socio-economic volatility. Furthermore the series also seeks to explore challenges of the future, where the changing nature of public-private ownership, artificial intelligence, space travel, 3d printing and manufacturing present scenarios that few working in the field have grappled with. Rashiq Fataar, director of Future Cape Town highlighted aspects of dealing with public spaces in his introduction to the event and the series as a whole in a presentation “the future of public space or public space of the future”. He pointed out that there seems to be an an abundance of public space but asked; Who owns it? Who uses it? 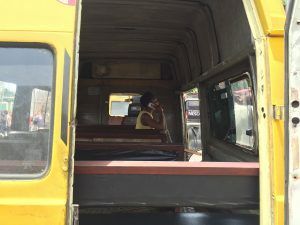 And more importantly – what is the point if there is no space to sit?Fataar quoted Khalied Jacobs of Jakupa Architects and Urban Designers, saying ‘our roads are actually our public spaces’ . To illustrate this point Fataar briefly elaborated on a parklet on Regent Road that Future Cape Town created in partnership with the property developer BLOK. The parklet takes is open to the public and takes up two parking bays along a busy street and now provides a place to sit where few existed, without having to order a coffee or meal at a coffee shop or restaurant. Fataar also commented that public spaces are very complex and that different parts of these spaces are usually owned and managed by different entities. As an example of this, he described the process of applying to do work on the Sea Point promenade, along which several departments were in charge of different strips of land. He argued that there needs to be a system or a way to deal with public spaces within the public realm that is more holistic and inspires more cross-departmental collaboration. However, Fataar also states that it is important to be able to measure the impact that an intervention has in a public space. How does one measure impact, or communicate change? Fataar asks. He goes on to explain a ‘tool’ that was used as part of an intervention at the Thornhill Park community park in Green Point where the ideal park was imagined. The power of these processes and the power of public spaces do however still lie in the opportunity for direct interaction between people as seen in the number of interactions through the Your City Idea project. This concept can however be explored further using digital methods and social media to communicate within public spaces. Fataar further highlights that public spaces are not always only external spaces, and that care should be taken to make sure that our public buildings and internal public spaces are accessible as well. He referenced the creative spaces organised through the Department of Design event in 2014, a collaboration with the Dutch Consulate in Cape Town. Lastly, he states that we constantly have to be looking towards the future. We need to understand what the context of the future will be and how people will live, and then we need to design and create towards that goal. Who cares enough public space? The first keynote speaker Barbara Southworth, director of GAPP Architects and Urban Designers presented a journey of public space in Cape Town from the 1940’s till now. She unpacked the history and custodianship of public space in Cape Town, from the spaces of the V&A Waterfront, the early years of the CBD regeneration projects such as St George’s Mall, the City’s Dignified Places Programme in the townships of Cape Town, the work of VPUU, co-design workshops during World Design Capital 2014 and finally back to present efforts of the private and public sector in relation to public space. Southworth started out her presentation in the 1940’s – the era of ‘the city beautiful’ where public space was viewed as a civic entity. The planning in the 1940’s she stated, was very much about the space and very little about the people. It was also during this time that the foreshore in Cape Town was planned and eventually developed. According to Southworth, this was almost the first time that space was made in a very conscious and formalistic way in Cape Town. This set the stage for the modernist development of the foreshore freeway in the 1960’s. These freeways also assisted, in a very direct way, in the forced removal of the people from District 6. The freeways replaced the ‘city beautiful’ idea of the 1940’s and the area became much more centered around cars, and also separating cars and people. The forced removals of the residents of District 6, who were relocated to temporary areas further outside of the city which eventually became overcrowded permanent residential areas. In the 1980’s there were a few regeneration projects which drew inspiration from other cities such as Toronto and the aim was to try and make public space again. These projects included the ‘greening the city’ initiative and plans to pedestrianise the city of Cape Town again. These initiatives, driven by the City Departments developed places such as the St George’s Mall and Greenmarket Square we know today. These were some of the first attempts to claim back spaces in the city for its people and often was up against immense opposition from local businesses along routes which would be pedestrianised. Following this, in the 1990’s the case of the V&A Waterfront emerged. Southworth stated that even though this space was private in some sense (and still is today) it did to some create a space for the people of Cape Town in its own way. At the time, this initially became a gated space which turned its back on the city in an attempt to ensure safety and security. However, this space was successful in showing citizens that public space could be cool and could be a place for everyone. With this as a background, in the 2000’s there was a shift in public space ownership ideas towards equity and integration. Southworth also touched on the fact that there are so many different City Departments that have ownership of different parts of public spaces and that if these departments aren’t communicating with each other or with other role players, there can be no real inclusive development. Southworth and her team set out to investigate the different public spaces in the city and highlighted the disjunction between beautiful public spaces at the V&A Waterfront and the other spaces that the largest part of the poorer citizens have access to. She stated that public space needs to be planned in a way that recognises that people in poorer communities also need beautiful and dignified spaces. Southworth showed that rich and poor people alike should have access to spaces to play and gather. Thus, the goal was to change Cape Town by looking at the most important spaces – where people get in and out of cars and in and out of buses and how these platforms could be used to contribute to a process of urban renewal through the creation of positive spaces. The aim of the interventions were to create integration between departments and to create public realms that work together towards better spaces for all. Southworth continued by sharing some of her own work in partnership with VPUU. Lastly, Southworth provided a view of the 2010’s and the trends of big investments in public spaces such as the Fan Mile and the Greenpoint Park as part of the 2010 FIFA World Cup investments as well as the CBD regeneration projects and developments around MyCiti and Non-motorised Transport. She concluded with a call to action – where are we now? And who is making public space now? Southworth makes reference to a few civic movements such as Open Streets, but also states that there seems to be little to no responsibility taken for public spaces on the Cape Flats for example. The question that ran through this narrative, and which was also posed to the audience and to the future of developing public space is; who takes ownership of these spaces? Who cares about the spaces? And why should we bother taking care of these spaces? Olamide Udo-Udoma the representative of Future Lagos, spoke about the notion that everyone does not think about public space in the same way. Udoma started out by stating that people often tend to think that there is no public space in Lagos. “We might think of a park, a square, or maybe a promenade with grass, water and trees, a space for recreation, reading and thinking as public spaces, but it is more than this” says Udoma. ‘Dafone’ – a public phone which pedestrians can answer and talk to a stranger that asks them fun questions. ‘Jigi Lagos’ which encouraged pedestrians to make use of pedestrian bridge over a busy street. By transforming city spaces into places of unexpected interaction this project, says Udoma, can act as a conversation starter for the change we would like to see in our cities of the future. Michael de Beer, a designer at GAPP Architects and Urban designers unpacked some of the qualities of the public realm that defines an Ethiopian city based on his travels to various towns and cities. De Beer used his experiences to re-evaluate the understanding of what public space is and the pressures that develop from global aspirations within an African context. De Beer presented images from the city of Haraar, where he investigated the way that the citizens experience the streets and illustrated how spaces are informally transformed to accommodate mixed-use programmes. De Beer compared the concept of public space in the city to that of a market – a vibrant and multi-layered platform for interaction between different urban actors. Claire du Trevou, a young architect and urbanist, investigated the differentiation between public and private space within the informal settlement of Alaska in Mamelodi, Tshwane. She illustrated how new interventions could speak a similar architectural language if one understands spaces and the transitions between them. du Trevou explained an architectural intervention in the area that proposed the development of a master plan for a mixed-use space within the informal settlement. Rike Sitas opened by panel by boldly proclaiming, “It is not us!”, as a response to the topic about designing spaces for the future. We do not have all the answers and we don’t not know exactly how the future will look, she says, but we do know that the future of African cities will be vibrant, young and connected. Sitas goes on to say that, We need to unpack the identity of these communities and their idea of space. She also made reference to a variety of public festivals that are emerging in different African cities, especially in Ghana. Sitas also made reference to new and different forms of public space activations such as the Harare Academy of Inspiration in Khayelitsha – a public art project, turning a small restaurant in front of Harare Library in Khayelitsha into 30-day arts festival. Korycki discussed some of the projects he has been involved with reflecting on how to generate public and commercial value from the infrastructure that dominates our public realm. These projects, says Korycki deal with the possibilities of physical structures to communicate information in a new way and potentially generate revenues that contribute towards maintenance and operation. Using project concepts for pedestrian bridges, he elaborated on how these spaces of movement become an intersection between commercial and public information and can contribute towards the long term viability of public spaces. “Public spaces are for all and can be for all” says Zahira Asmal from the City Agency. In response to a question about how to use a community hall in Cape Town, she responded that “it is important to remember that public spaces are for all kinds of people and can be used by different groups for different activities at different times of the day”. With that in mind she continued exploring how one goes about rejuvenating such a space. Asmal went on and shared some experiences of her work from the Park Station in Gauteng, where very few places to sit existed, and where at the busiest transport interchange in Southern Africa, there was no sense of welcome or arrival for all people who came from different parts of the country and continent. The panel concluded that there is still a lot that can be learned from our public spaces and that in order to achieve any success, collaboration between different role-players is necessary.